There are two distinct areas of the Project; the western slope, located in the Hunter Creek and Fryingpan River watersheds, and the eastern slope in the Arkansas River basin. These areas are separated by the Continental Divide, which in many places, exceeds an elevation of 14,000 feet. The Project consists of diversion, conveyance, and storage facilities designed primarily to divert water from Colorado River tributaries on the western slope for use in the water-short areas in southeastern Colorado on the eastern slope. The North and South Side Collection System and Ruedi Dam and Reservoir are located on the western slope in the Fryingpan River basin. Sugar Loaf Dam and Turquoise Lake, Mt. Elbert Conduit, Halfmoon Diversion Dam, Mt. Elbert Forebay Dam and Reservoir, Twin Lakes Dam and Reservoir, and Pueblo Dam and Reservoir are all located on the eastern slope in the Arkansas River basin. Turquoise Lake and Sugar Loaf Dam are located just east of the Continental Divide, approximately five miles west of Leadville, Colorado. Turquoise Lake provides storage capacity for the regulation of Project water delivered from the Boustead Tunnel, as well as contract waters which are not a part of the Project. After the Project water is used at the powerplant the water flows into Twin Lakes. 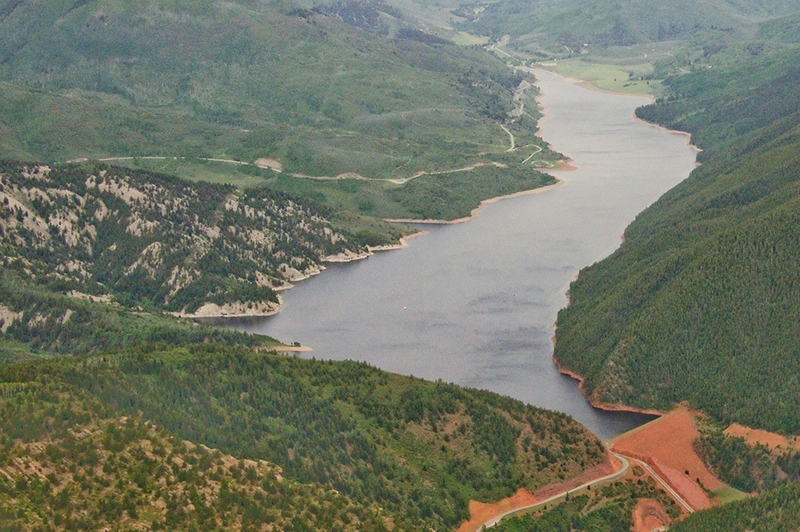 From Twin Lakes Project water is released to Lake Creek and the Arkansas River for delivery to water users upstream of Pueblo Dam and Reservoir or storage in Pueblo Reservoir. The distance from the confluence of Lake Creek and Arkansas River to Pueblo Dam is approximately 143 river miles. Project water is released from Pueblo Reservoir to the Arkansas River for irrigation and municipal use. Pueblo Reservoir is the terminal storage feature for the Project. The Mt. Elbert Conduit, a 10.7 mile, 90 inch diameter pipe, conveys water from Turquoise Lake to Mt. Elbert Forebay. Water delivered from the forebay is used to generate power at the Mt. Elbert Pumped-Storage Powerplant. The Mt. Elbert Pumped-Storage Powerplant is located approximately 13 miles southwest of Leadville, Colorado at the northwest corner of the lower lake of Twin Lakes. The powerplant has two pump-generator units, each with a capacity of 100 megawatts. The Halfmoon Diversion Dam diverts available flows to Halfmoon Creek into the Mt. Elbert Conduit. Like a monument to its namesake, the Mt. Elbert Pumped-Storage Powerplant stands at the foot of Colorado's highest peak, the 14,422 foot Mt. Elbert. The building was designed along modern architectural lines. The all-concrete structure is equivalent to a 14-story building, though most of the structure is below ground. The energy for power generation comes from water stored in the Mt. Elbert Forebay. This stored water drops an average of 445 feet through two pipes called penstocks to the Powerplant below. Force of the falling water spins two hydroelectric generators developing a total of 233 megawatts per hour of electrical power annually. This is enough power to serve the annual electrical needs of 26,200 homes. The generators are also designed to operate as a 170,000 horsepower electric motor which drives the turbines in reverse to pump the same water back up to the forebay so it can be used again to generate more power. This pump-back storage principal is advantageous because the generating units can be started quickly, and adjustments of power output can be made rapidly to respond to varying patterns of daily and seasonal power demands. Ruedi Dam and Reservoir provides storage for replacement and regulation of water for the western slope users. The Project provides water for irrigation, municipal, industrial, recreation, and fish and wildlife purposes. The North and South Side Collection Systems on the western slope collect the high mountain runoff and convey the diverted waters into the inlet portal of the Charles H. Boustead Tunnel. Sixteen diversion structures on the western slope are used to divert water into the Project collection system. The system includes nineteen tunnels with a combined length of 29 miles. The five mile-long Boustead Tunnel conveys the water from the North and South Collection Systems under the Continental Divide to Turquoise Lake on the eastern slope.